An experiment: Here I've used the rough side of hardboard (aka Masonite) to paint with pastels. Many layers were involved with acrylic fixative in between. While I wouldn't recommend this method, it was certainly interesting. I took the photo of this painting outdoors near noon. Although it was a cloudy day the overhead light was more than sufficient to emphasize the strong grain of the board, as you can see. Depending on the light angle, this grain may or may not be so visible. 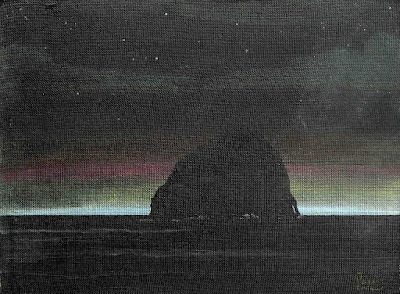 Furthermore, the painting is dark and the acrylic fixative is glossy - so that in certain subdued lighting situations, the pastel painting appears to be basically just black with maybe a little line of horizon showing. I'm reading: Night Scene PastelTweet this!